The Pechanga Casino and Resort is located on the Pechanga Reservation in Temecula, right of Interstate 15 from San Diego. This is a full scale casino resort that comes with a dedicated gambling floor, 14 story hotel, a 1200 seat arena, 10 restaurants and a convention centre, so it’s more than just your regular pit stop. It also has its own golf course, the Journey at Pechanga, as well as a spa and health centre if you’re looking to do more than gamble and eat. When it comes to gambling, Pechanga has the biggest casino floor in the state of California with over 180,000 square feet of gambling space – an area that’s a tad bigger than the MGM Grand in Vegas. The casino floor holds the standard assortment of slots, over 130 tables, including a 40+ non-smoking poker room, a bingo hall, a high-limit salon, a sports bar, as well as private rooms for those looking for a different game. Pechanga is one of the biggest tribal casinos around but they mostly have tables with continuous shuffling machines (CSMs) in the pit. However, there’s still value to be found, as the casino also offers a decent 6 decks and double deck game. 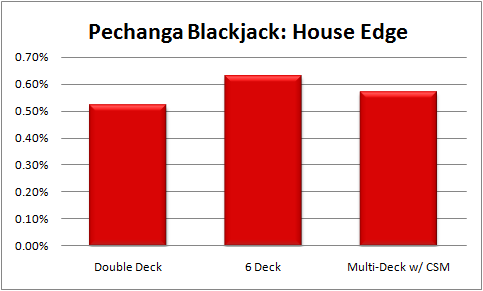 Just like almost every bigger casino, Pechanga also has the 6:5 single deck games which are becoming a standard in the industry. The house edge is ridiculously high at these tables, or 1.57%, and the bet sizes range from $10 to $100 dollars. There are 4 of these single deck games at the pit and they should be definitely avoided, but if you still want to take a look keep in mind that the dealer hits on soft 17 here. Pechanga has about 15 double deck games in the pit (even 2 in the high limit salon) which have slightly better rules. However, if you’re looking for 3:2 payout shoe game at the casino you have to spend a $25 minimum per hand. The double deck games have decent rules, with dealer hitting on soft 17, doubling after splitting allowed, and doubling down on 9-11s. There’s no re-splitting aces nor a surrender option at the table, while the penetration is average, with dealers dealing slightly more than a deck. The house edge here is approximately 0.4%, while the max bet is set at $3,000. The second largest portion of Pechanga’s Blackjack offer are the 6 deck shoe games, most of which can be found in a single big area inside the main pit. All main area 6 deck tables come with a $25 minimum, just like the double deck games, but the max bet here is set higher, at $5,000. These tables have the dealer hit on soft 17, which raises the house edge a bit to 0.63%, while other rules are fairly standard: doubling down on any two cards and after splitting is allowed and there’s no re-splitting aces or surrender. But the good thing is that you can also find a $5 game on a slow night. There are 30 something tables with CSMs in the main pit at Pechanga, which have a slightly better house edge than the 6 deck games but are nightmare to card counters. These tables are most frequented by recreational players and tourists who jump on board due to the $10 minimum and they have the dealer hit on soft 17. Doubling on any two cards and after splitting is also allowed, but there’s no surrendering or re-splitting aces, giving the game an approximate house edge of 0.57%. Pechanga is first and foremost a large casino, so it is easier to count cards here than at other smaller tribal casinos. However, despite its size, it also has rules to counteract card counters, like the “can’t bet more than 5x your original bet” rule. But if you keep this in mind, there’s value to be found at the 6 deck games, where you can have enough time to vary your bets, or the double deck tables which have the best house edge, but are also easier to draw heat in. But all in all, the heat is not very strong, as long as you don’t overplay your skills. If you are in the LA or San Diego area and are looking to change up things a bit, Pechanga is a good place to start as it has a fair game offer and offers decent “soft” comps to new players. Thus, if you keep your play under the radar, you can even make good money while still win a complimentary stay or free play at the casino. Pechanga has an odd rule that you cannot raise your bet by more than 5X your previous bet. This makes it difficult to jump your bet on a quick count. If you’re card counting at Pechanga, you probably want to play the 6 deck games so you have plenty of time to move your bets. Most blackjack tables at Pechanga use a continuous shuffling machine, so when counting cards you need to find a section in this huge casino that has real shoe games.